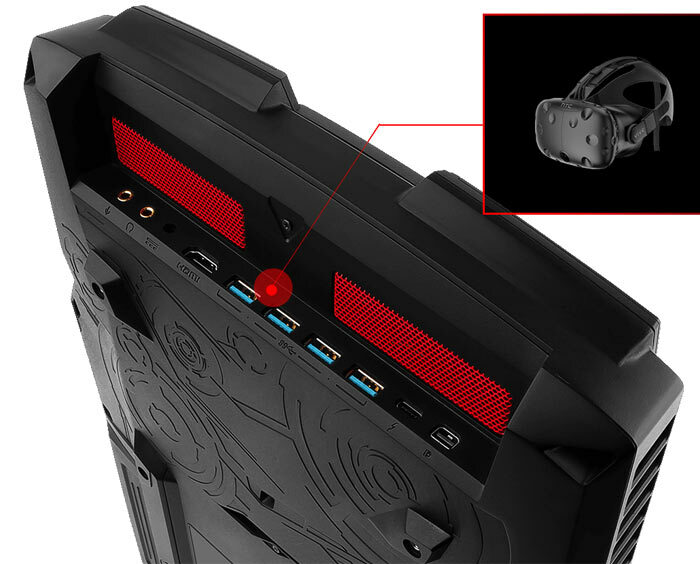 MSI previously teased its first ever VR Backpack PC back in spring before we saw a much fuller reveal of the system at the Tokyo Game Show in September. 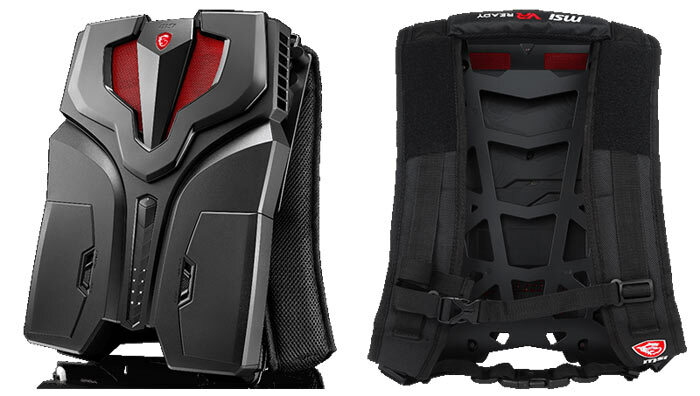 Earlier today MSI announced that the VR One VR backpack PC has hit retail. Initial availability will be in the US, Europe, Japan, Australia, China and Taiwan. 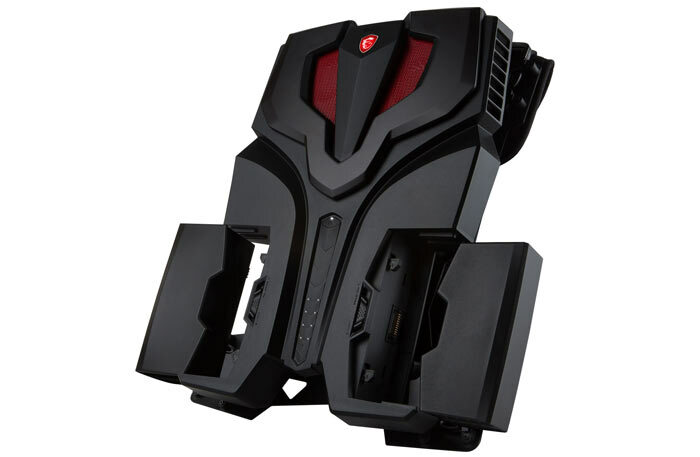 It is claimed that the MSI VR One backpack PC is the lightest and most powerful of its kind on the market. The backpack weighs under 3.6Kg and is just 54mm thick. This portable VR machine boasts twin swappable battery packs that can provide "1.5 hours of full speed gameplay." It is good to see that MSI shared this meaningful usage metric. MSI's news release and product pages don't contain full system specs but I've collected what we know so far plus some details from the retail listing at Scan UK. Ports: HDMI, Mini DisplayPort, ultra-fast Thunderbolt 3, 4x USB 3.0 ports, mic-in and headset connectors, DC out compatible with the HTC Vive. All these ports run across the top of the unit. Bundled: 90cm HDMI and USB 3.0 cables, also 1x 12V cable optimized for the HTC Vive. The VR One is said to run cool enough while delivering its VR goodness to not heat your back. You also shouldn't be able to hear it, says MSI, as it operates at less than 40dBA when in a VR games experience. MSI intends to supply extra batteries and an external four port charger to help you create non-stop portable VR experiences. MSI is marketing the VR One for both b2b and consumer sales. When not in use for VR japes it is suggested that a good use of the system would be as a portable desktop PC replacement connected to up to 3x monitors. Unfortunately MSI didn't share worldwide pricing information but Scan Computers in the UK lists the GTX 1060 version at £1,899, and the GTX 1070 version at £2,199. For other world regions where this backpack is supposed to be available right now I suggest you have a nose around your preferred suppliers online. Scan's stock is currently listed as 'awaiting an ETA'. So this is all about cable-free VR, right….? So… where do you plug in the position-sensing base station(s), then? Certainly for the Vive there is no issue with the base stations as these are going to be static, screwed to wall and plugged into the mains. Communication with the headset is already wireless. The issue I see is being able to provide power to the Vive headset itself as it needs its own power source and there doesn't seem to be a way to plug that into the backpack. … The issue I see is being able to provide power to the Vive headset itself as it needs its own power source and there doesn't seem to be a way to plug that into the backpack. Whats the point if you need a backpack anyway?? "Ports: HDMI, Mini DisplayPort, ultra-fast Thunderbolt 3, 4x USB 3.0 ports, mic-in and headset connectors, DC out compatible with the HTC Vive. All these ports run across the top of the unit."